Ever since the beginning of the Games, the Bikini ART museum has been present on the spot in Rio de Janeiro, thus we have been able to collect various great impressions and experiences, which we certainly do not want to deprive you of. Yet in the beginning of the Games we were able to follow an unforgettable event within the context of the opening ceremony, which admittedly makes us very proud in particular: Probably Brazil’s most famous woman and advocate of the Bikini ART museum Helô Pinheiro was given the unique opportunity to take the Olympic flame on the final steps of the over 10,000 kilometres long journey leading through 325 cities. The 71-year old Bikini-diva once got famous for being the inspiration for the bossa nova classic “The Girl from Ipanema” by Antonio Jobim in 1962. To this day, she is one of the most influential and popular women throughout Brazil. Already during our last visit in Rio de Janeiro we managed to enthuse the 71-year old about our unique project and within this context, we filmed a report about the remarkable life of the Bikini icon. Extracts of this commentary have inter alia been on air in Brazil – and the whole report will be shown in the Bikini ART museum! 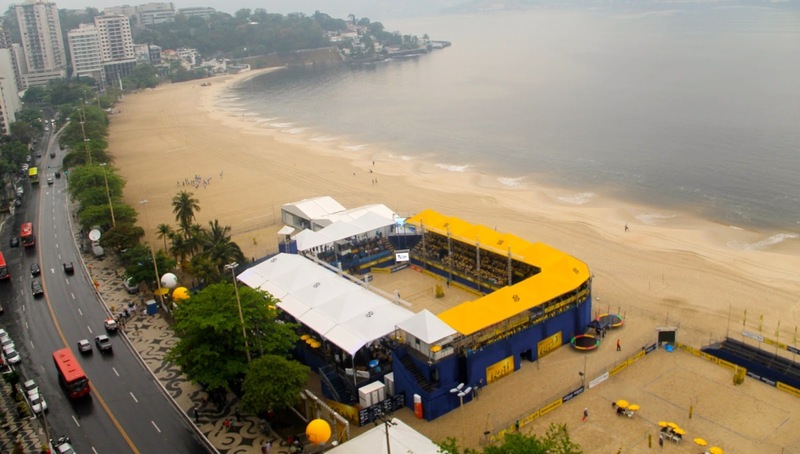 In the following Olympic days, we had the pleasure of visiting the giant Beach volleyball stadium Arena Volei De Praia Copacabana, which was established right at the beach of Copacabana and seizes 12,000 spectators. Having been constructed only for the Olympic Games, in our view, this arena is the main attraction of these Games, thanks, in particular, to its unique location: just behind the stadium lies the Atlantic Ocean, whose waves can be heard as far away as in the arena. Furthermore, the main stand of the stadium offers a magnificent view on the sea and the Sugarloaf Mountain. In the course of the first round matches between Germany and Egypt, we were able to experience another Beach volleyball speciality: for the first time in the history of Olympic Beach volleyball, Egyptian players were allowed to wear burqinis during the match. In addition, we visited the Beach volleyball match between Holland and Costa Rica. Another aspect that had been wildly discussed in the run-up to the Games is the fact that a large contingent of police and military should be deployed around Rio, which we could confirm as well. Only one day before the opening ceremony various protests and demonstrations took place on the Copacabana. However, on the first official day of the Olympics, there was nothing to be seen – the large contingent of police and military did not allow anything more. Furthermore, at the beach of Copacabana and in the surrounding restaurants and bars large numbers of people congregate. This, of course, is a result of the fact that almost every premise offers giant screens on which the diverse competitions can be watched on. What we noticed: The “Cariocas”, Rio’s inhabitants, are real beer lovers – similar to the Germans. Surprisingly we found that beer of German origin seems to be fairly popular amongst Brazilians. We also found out that beers of the “ALLEGRA” brewery are not only brewed with adherence to the Bavarian Purity Law, but the master brewer has even spent a fair amount of time in Germany. A real insiders’ tip for those planning to travel to Brazil! Additionally, we are pleased to say that our first and brand-new Bikini ART museum t-shirts are highly popular amongst the inhabitants as well as amongst the visitors and tourists. Thus, many new customers could be acquired – mainly at the Copacabana beaches. Priscilia, a lovely Brazilian woman from Recreio, a suburb of Rio de Janeiro, was able to purchase one of our first Bikini ART museum shirts, as you can see in the photo below. That were our impressions from Rio de Janeiro - We will also keep you updated in the coming days and weeks!